As Warm As Toast: Super easy "T-25" salmon! So if you are familiar with Shaun-T you'll be familiar with his workouts called T-25. Essentially, they are a series of workouts increasing in difficulty as the weeks progress and they all last for just 25 minutes. I love them; mainly for the reason I can get dressed, warm up, workout, cool down and shower in about 45 minutes flat. This is great for me when I cook from scratch pretty much every night because it means I still have that time in the kitchen, we're not eating dinner too late but I still get my downtime in front of the tv in the evening. The reason I named this recipe after those workouts is because it can be cooked in the time it takes to do all of the above activities - 45 minutes. Pre-heat the oven to 180. Add the potatoes to a roasting tin and drizzle with some of the oil. Season with the paprika and some salt and pepper. Pop them in the oven for 20 minutes. Lay a sheet of tin foil down and cover this with a piece of greaseproof paper on top of this. Place one salmon in the middle of the greaseproof paper and drizzle with a little oil. Season the salmon with salt, pepper and half the chilli flakes, ginger puree, and sweet chilli sauce. 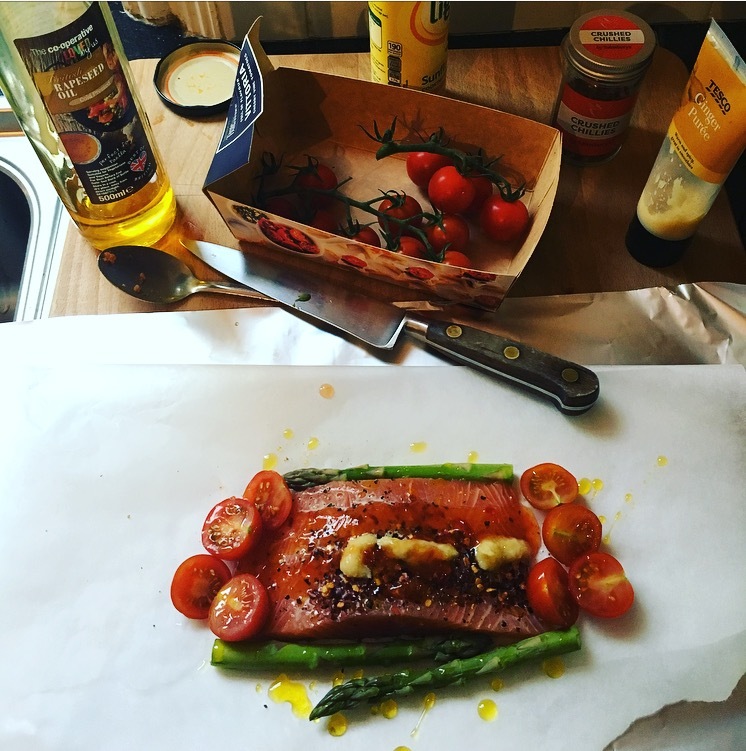 Arrange the asparagus and tomatoes around the salmon fillet. 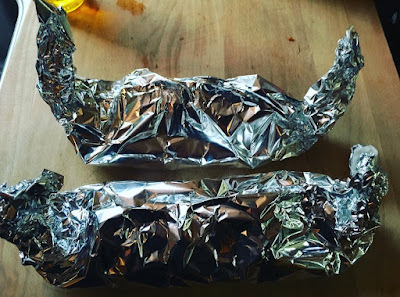 Wrap the salmon up like a parcel; if you take the two ends of the tin foil and bring the long sides of the foil together you can easily wrap the fish up into little canoe shaped parcels (I think the below picture will probably be easier to follow than my convoluted instructions!). Repeat with the other salmon fillet. Pop the salmon in the same tin as the potatoes and cook for 25 minutes. Serve with sugarsnap peas, broccoli and the roasted potatoes.